Release 2.2 of SAP Predictive service is now available. Improvements in the performance, of the security and fix devops bugs. APL 3.3.0.2 is now supported. When creating a job, the input parameter of the response is now formatted as a JSON object instead of a string (see Job Response Body Parameters). EXX121 is a new message related to incompatibility between input parameters (see General Service Parameter Error Messages (EXX)). Key Influencers: The service now allows end-users to get the variables that are correlated to each other, with their coefficient of correlation (see Response Body Parameters). An important note has been added to the Clustering APIs documentation to explain the link between the view export method and the modelSQLExportEnabled input parameter (see Clustering Request Body Parameters). A correction has been made to the data source binding procedure. Only <default> can be used as data source name (see Bind the Data Source). The new collection of services Predictive Analytics Integrator Services is available to add model management tasks to your application. See Service Description. This brings the possibility to train an Automated Analytics model on a registered dataset and to apply this model on a new dataset to obtain predictions on the target variable. The steps to update from a previous 1.x release are the same. There are only 2 differences mentioned below, but a more complete description is given here. 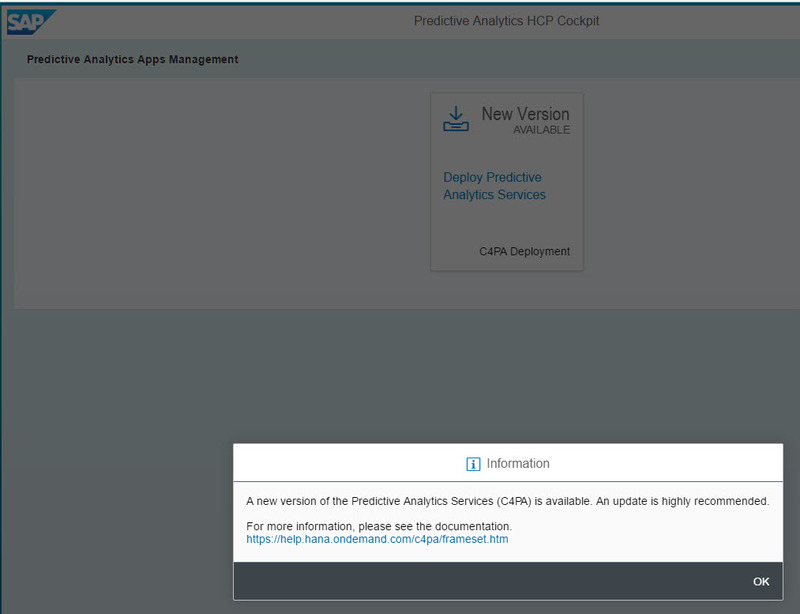 On your Database Systems, install SAP HANA Component SAP Predictive service Engine becomes mandatory each time there is a new version of APL and/or a new version of Predictive Analytics Integrator Services. The technical database user must be granted role hana.pai::ExecutePAI to be able to use Predictive Analytics Integrator Services. Clustering service:The service now allows end-users to specify the distance used to measure the proximity of two data points. This is enabled through the distance input parameter. See Clustering APIs. See Forecast APIs for more informations. Dataset service: The service now allows application users to specify the schema and the table/view of the dataset in SAP HANA separately in the request. This is enabled through the location input parameter. The hanaURL parameter has been deprecated. Refer to technical help for details. Scoring Equation: The service now allows application users to choose the type of output generated by the scoring equation (predicted value or probability). This is enabled through the predictionOutputType input parameter. See Scoring Equation APIs. Outliers and Scoring Equation: now allow application users to set the key of the target variable through the TargetKey input parameter. All services: The variableDescription parameter has been deprecated from the request body of the APIs. From now on, application users must use the Dataset APIs to specify the variable descriptions or to modify them. The documentation now specifies that referenceDate must follow the ISO 8601 format in the Forecasts API request. This is a new service which segment your dataset into homogeneous clusters and export the segmentation results into a SAP Hana table or view. Assign a cluster to each element of the population. Version 3.2.0.5 of APL is now supported. Go to menu Persistence/Database Systems, select your database system and click on “Check for updates” button to get this new version of APL. Outliers: The service now allows application users to enable autoselection of variables through the autoSelection input parameter. Documentation is updated to reflect these enhancements and new features. The name of the services follow the new naming convention of the cloud platform. So the new name is: SAP Predictive service. “smoothing” technique which generates forecasts by smoothing a time series. The cycle length to use is mentioned is the parameter “smoothingCycleLength”. It is an integer whose default value is null. When a dataset is registered, it is now possible to flag a variable column as a component of a primary key. SAP Predictive service can be explored and tested with 4 datasets from the SAP API Business Hub. Improvement and optimizations of existing services. A link has been added to the Overview to point to videos explaining how to deploy Predictive. Now this service detects about 2% or less outliers in the training dataset. Modify the description of the variable of a dataset. Enable a user to correct the description of the variables of the dataset if what was determined by the guess is not correct. For example, forecast service requires the target column to be continuous. If it’s not, continuous type can be forced to continuous. The Predictive service supports SAP HANA 1.0 SPS12. When this service is called, it is now possible to request in the input parameters the number of historical values to display in the output. This allows to simplify the access to historical data. A new section about model information is also added to the output. Now the trend, the cycles and the fluctuations are available. Based on historical transactional dataset of the form customer/item pairs, this service creates a recommendation model (recommender) and uses it to generate a list of items (recommendations) to suggest to a specific user. Look at this video and/or this presentation which illustrate how to use the recommendation service. This services now returns always the number of forecast requested. HTTP status 400 is returned when there is a syntax error in the call of a predictive services. Predictive service is more robust when several jobs are run concurrently. Statistics returned are computed based on the current state of the dataset. When the input parameter to indicate the number of desired outliers is set to 0, the service will return all the outliers and 100 outliers are returned if no value is provided. A new output parameter called “Maximum confident horizon” is provided. It represents the maximum number of forecast where the performance indicators of the best model are reliable. When the date column contains time information, it appears also in the forecasts results. How to get this new release? The cockpit of the predictive service opens and alert you that a new version is available as shown in the screenshot. Click OK then click on the tile and deploy the new release.